Plot - A British animated film about an elderly couple who survives a nuclear holocaust and attempts to restart their life in the aftermath. James and Hilda Briggs are elderly couple living in the rural Sussex in Southeast England. James suspects an impending nuclear attack with government distributing Protect and Survive pamphlets and makes a shelter under his house. His worst nightmare comes true as Soviet Union launches nuclear attacks destroying everything including their house. The couple survives their last remaining days at each others side as they wait in vain for help to arrive. 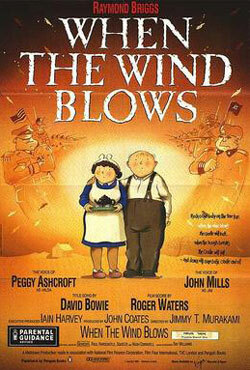 Awards & Nominations Won by "When the Wind Blows Movie"
Box Office Earning of "When the Wind Blows"